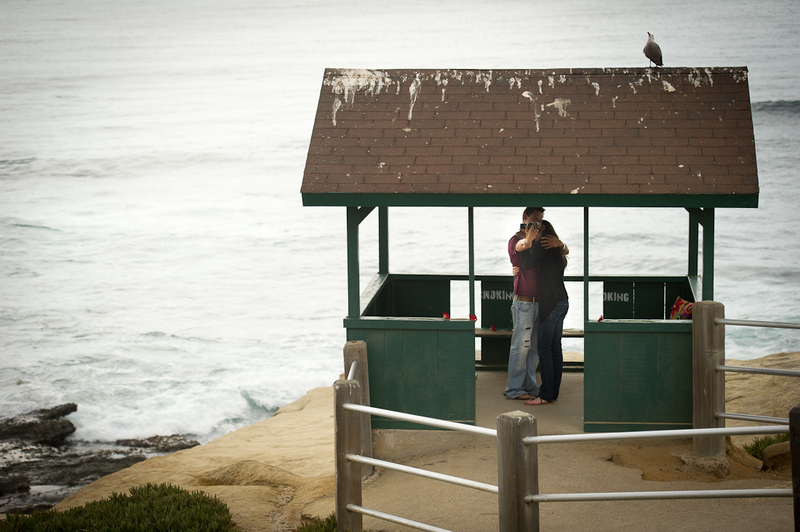 So there I was walking around with Ed Sanchez (one of the co-founders of NIk Software) getting some fresh air out in the beautiful La Jolla, CA area. We were in the office checking out stuff but the day called us out to just go walk and take the sea air in. We all grabbed cameras, just in case, but I think we were mostly into just being outside for the afternoon. As we were walking, I notice a girl running down this ramp to a young man waiting, taping her with his video camera the whole time. He’s in this little Gazebo and, despite the wind, its adorned in red ribbons notecards and little tea lights. She gets to him and hugs him as if she hasn’t seen him in a million years, and he turns the camera to himself. I think to myself “This guy isn’t done yet.” As I’m doing that, I see Ed talking to another girl in spanish whos standing by the rails. She tells Ed that he is going to propose. It makes me go back to several years ago in my head. I surprised my wife Jenn during our engagement (that’s another story for another day), and someone had the foresight to make sure it was taped. I’m a big storyteller.. and I love talking about all of the cool moments that happen to us. I’m also grateful to have the NIkon D3S with me that also happens to do movies in addition to pictures. It’s not the best video that i’ve shot. Its shaky in some spots.. soft in others.. but that doesn’t matter. What’s most important here is the look on her face. The intensity in how they hold one another. This was their moment. I gave them some time alone and just waited a while till they seemed to be back to normal. I walked over and congratulated them. I then gave them my card and told then it would be my pleasure to send them any video I got and some pictures if they wanted. They immediately said yes, and let me do a couple more frames of them by the sea. You can just feel how happy they are. Thankfully – they’ll be able to as well for the rest of their days. I've got goosebumps and am completely misty-eyed... Such a great video. Just goes to show that you don't need fancy shooting or editing as long as you capture the "heart" and raw emotion of the moment. Simple... and, so amazing! Way to go, RC! Dude, that is so AWESOME!!!!!! They are going to love this for the rest of their days. Vive L’amour indeed! =) Well, that caused a few happy tears over in our office. Thanks for sharing that RC and congratulations to the happy couple! Man, you make me clap this video!! There are moments like these that make us believe that tenderness and respect still are among us, in a world we live nowadays. Thanks for your perception, and thanks for sharing it. Keep this feeling in your job ! That's awesome that you happened to be there when that happened! Very nice! RC - that is an awesome video. It is for these types of moments that we become photographers. Soft and shaky video does not even compare to capturing the emotion of this life changing moment. AWESOME!!!!! I got CRAZY goosebumps watching this. Really, really beautiful thing to watch happen. This is a very powerful video and you captured the raw emotion of young love! Well Done! This is so amazing, so special....love it! I posted a link to it on my fb page too..I think more people should see it! :) Thanks - great stuff!! Wow. I just cried. That was amazing. Thanks so much for sharing. Incredible, and so beautifully captured. Thank you so much for sharing it with all of us!! LOVE it!! Wonderfully done. I proposed in a gazebo once. It was beautiful and I wish that you would have been walking by. Simply beautiful. Nice job on capturing such a special moment in the lives of these two. WOW, I'm speechless. Simply amazing. You truly captured the emotion and feeling of the moment. It's photography like this that reminds me why I picked up a camera years ago and inspires me to keep learning, experimenting, and growing with it. The power a photographer has to do good or evil, to profoundly impact many people's lives, should never be taken lightly or forgotten. You'll likely never know how many lives you will have touched with your simple act of kindness and thoughtfulness; the new couple will certainly cherish it the rest of their lives, as will their future children and following generations I'm sure. Thanks for sharing! I heard about this video via someone I know on a website called mu-43.com I knew this fellow would never post about anything that wasn't worth my time. I just watched it and am still feeling the tears. What a gift you've given these two, and what good fortune that we are able to experience it thanks to your being there with your camera. Real life - light years beyond anything scripted. Thank you so much and thank you to Scott Bourne's site for leading my friend here. You were put there at that moment for that reason. Wonderful pictures, RC!!!! Thanks for sharing. I'm weeping like a little baby, RC. And knowing you and your kindness makes it that much more special! They'll cherish this gift forever. (Where were you when I got engaged?) LOL! Thank you so much for sharing this with us, it is very special for our family. By the way, their names are Isaac and Daniela. Wow! That touched my heart. You captured beautiful memories for this couple. What an amazing vid. Thanks for sharing. I know this couple... She is one of my best friends!! RC thank you so much for this... I'm sure that Daniela & Isaac will treasure it for ever. And thank you so much that because of you I could see how they got engaged !!! Lovely and Special. A wonderful reminder that simple is better. And "real" rules/rocks. I´m the mother of the bride to be. I can´t thank you enouph for this video. You made my family very happy, and made everybody cry!!! It´s a memory that will last forever. Thank you sooooooo much!!! There are some moments in your life that make you happy to be born. I'm sure this one will count for the rest of their lives, and, thanks to you RC, this lovely couple will keep a proof of their young and deeply sincere love. Cheers to you RC, you made this day warmer for me! RC - what a great gift you've given them - beautifully done! Another example of the lesson: Don't leave the house (or the office) without your camera...can't get the shot if you don't have the gear in hand. You've given them a gift and you've given the world a gift too. What better gift is there than to be reminded of the power of love. Tears here. I'm Norman from the Philippines. Congratulations to both of you. I had goosebumps when i watched this video. It reminds me of some old love story in the movies. It is very romantic and you will feel that they love each other so much. I wish i could do like this with my wife. Congratulations and Best Wishes. wow, what a wonderful moment for ALL of you! This is why we have our cameras with us at all times...you never know!!! This made me be in love with love again....thanx to all and congrats to couple.